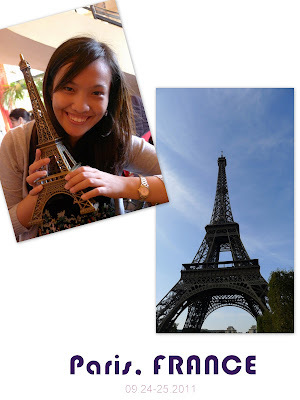 Paris is probably one of the most visited places in Europe. everyone knows of the famous Eiffel tower and it is a symbol often used and associated to travel - i have mine in a pretty little gold pendant to inspire me to go out and see the world. 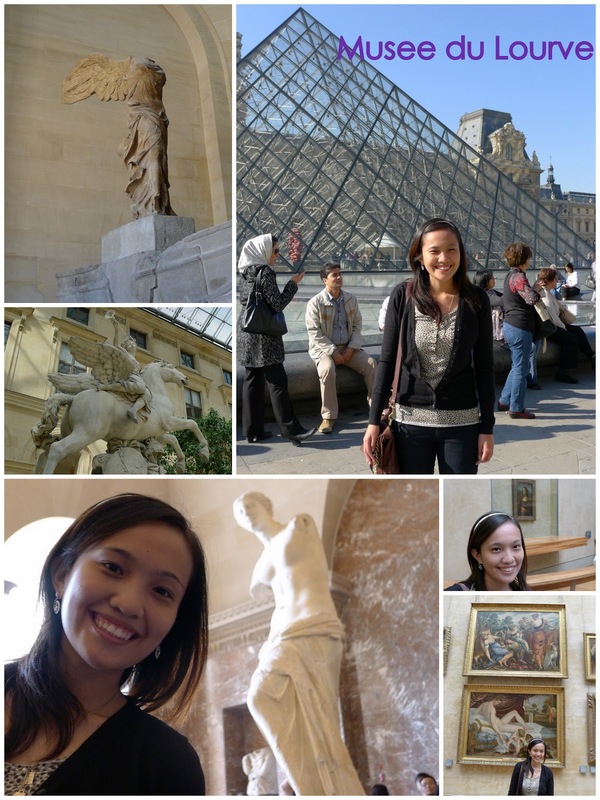 first stop - Musee du Louvre. The Louvre Museum. home to Mona Lisa, Venus de Milo, the Winged Victory of Samothrace and the code of Hammurabi. the museum is so vast and rich with collections that a day won't be enough to go around it. i dub this place as the artist's heaven. Grand Palais (Palace). it was a nice walk towards the Arc de Triomphe (Arc of Triumph) when we realized we can see it, but it wasn't near. 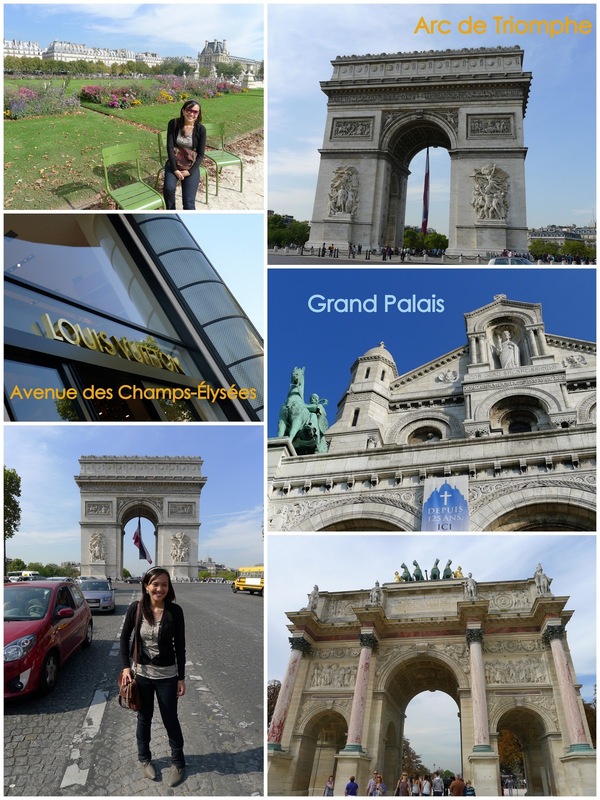 so we headed back to the metro and emerged into the shopping district of Avenue des Champs-Élysées! ooh-la-lah, designer and high-end fashion heaven! 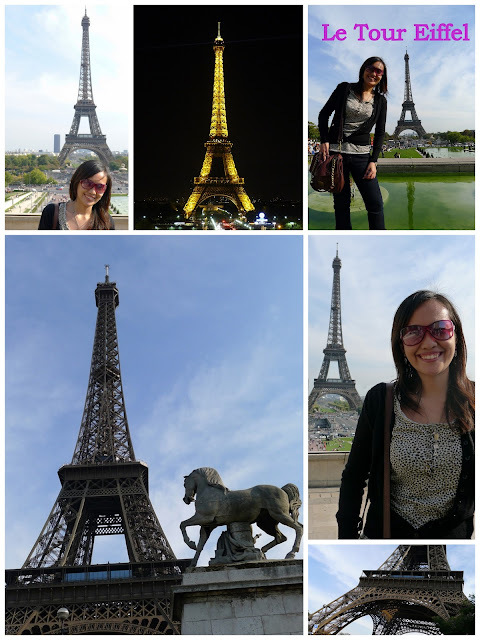 Le Tour Eiffel. The Eiffel Tower captivated me thrice that day. the first time was when i saw it from afar. the next was when i saw it up close (we approached the tower from Trocadero, and the view was breath-taking... so much thanks and hurrah to googling and travel guides!) and the last one was when we came there at night to see it at night with the illumination show that happens every hour. this is why Paris is the city of lights! 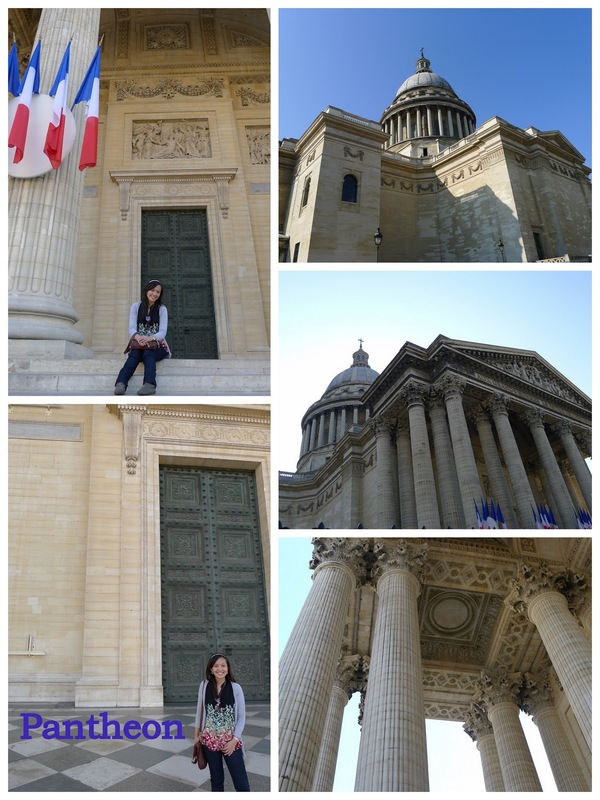 aside from the Eiffel, Paris is also home to great churches. 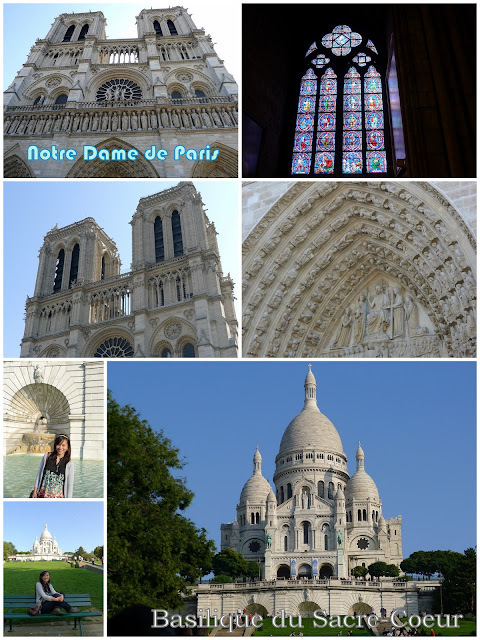 who haven't heard of Notre Dame de Paris? this of course, was popularized by the animated movie - The Hunchback of Notre Dame, one i had watched when i was just a little girl. on the hilltop, Basilique du Sacre-Coeur (Basilica of the Sacred Heart) was a sight to behold. the Pantheon, inspired from the Roman Pantheon, is the final resting place of Paris' who's-who - including Voltaire and Rousseau. Paris is also home to beautiful gardens. i enjoyed walking around their lush gardens, and realizing that hey, it's already autumn at this side of the world! 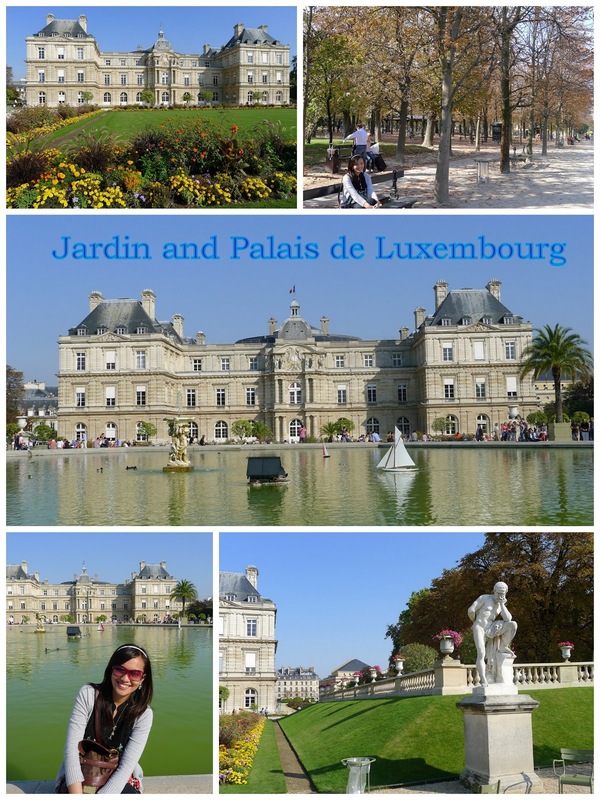 i specially admired the Jardin de Luxembourg (Garden) and Palais du Luxembourg (Palace) which is just a stone's throw from the Pantheon. up to date, Paris is definitely one of my favorite places so far. it certainly lived up to the hype. you'll never be the same (well sort of), after Paris.